About the Wine: The Passaggio Wines 2018 Unoaked Chardonnay is made from 100% Chardonnay grapes harvested from the Namesake Vineyards located in Sonoma County’s Los Carneros AVA. The wine was, as mentioned, aged in 100% stainless steel tanks. Flavor Profile: Warm, round comforting scents immediately as the wine is poured from bottle to glass. The Chardonnay emits a solid golden yellow in the glass, reminiscent of a classic Chardonnay — which this absolutely is not. Initial aromas are of yellow apples, apple blossoms, a hint of pollen and an almost pastry like decadence. But the palate could not be more different. Zing! with lemon-lime zest hit the tongue straight-away; a confident acidity rides evenly from start to finish; that “pastry” sensed on the nose becomes a mere background element, revealing itself in a more toasty than buttery flavor. Dominant flavors are of green apple and pear, white peach, perhaps a hint of apricot, and an over-riding floral perfume that both complements the fruit and elevates the delicacy of this uniquely refreshing Chardonnay. Food Pairing: I loved that I was able to enjoy this Chardonnay over the course of a few days, pairing it with a ricotta cheese ravioli tossed with veggies and cream sauce as well as an Indian-style wrap and salad. Better yet, I enjoyed this wine during the work week. Unpretentious, unassuming, it’s peppy with flavors that act like the light at the end of a work-day tunnel, but light enough that you don’t feel weighed down or guilty for sipping it knowing you have to get up the next morning. I also have to point out here that I love that Cindy’s white wines all come with screwcaps. It makes them a) much more inviting to open on a “I just feel like it” kind of basis and 2) [I think] makes the wine easier to preserve and thus enjoy over the course of a few days, as I’ve done with all of her recent white (and rosé) releases. More Info: I received this bottle as a gift. (Cheers, Cindy!) Price: $36. 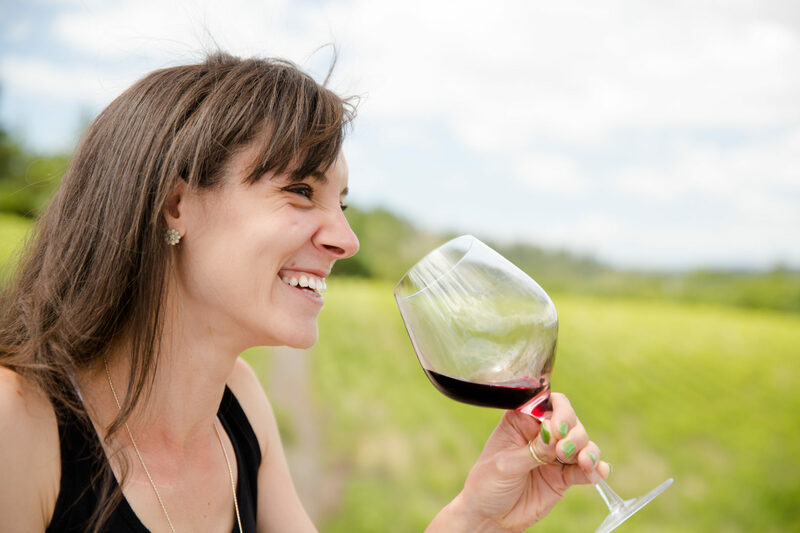 For more information about Cindy, her wines, and to purchase wine directly (and stalk for the latest releases) please visit the Passaggio Wines website. AKA “orange wine.” I recently spoke to a veteran winemaker who suspects that the next winemaking ‘trend’ will be orange wine. Orange wine is made with wine grapes traditionally used to make white wine (like Pinot Grigio, Semillon, or Riesling) but it’s made in the way red wine is traditionally made — with skin contact. This is a little sneak peek post. This wine isn’t officially on sale until next month, but hey, why not start planning your summer sipper shopping list now? In all seriousness, though, this wine is called passion because that’s what winemaker Cindy Cosco has—serious passion for her craft. Solid body, packed with complex flavors and textures, this is a full-on white wine blend for the kids that don’t think they like white wines or are hesitant to pair white wines with a substantial meal. Winemake Bret Urness is a boots-in-the-dirt kind of winemaker and his wines speak to that. Sourcing from some of the best vineyards along the Central Coast (Ballard Canyon, Solpman, Duvarita anyone?, this guy makes some of the most earthy (but elegant) Rhone wines I’ve tasted — and yes that goes for the white wines as well. I don’t know what made me stop in Tin City on a drive through the Central Coast. And I can’t say why, in particular, I walked into Bret’s urban tasting room. But I do know I’m glad I did and reliving that visit via this wine reminded me why I came away with a couple of bottles.